There's no doubt that you're going to want to remember every aspect of your wedding, forever - the type of flowers you had, what your cake looked like, and of course, what your wedding announcement looked like in the paper that day. Unfortunately, taking a picture of the announcement just doesn't cut it, and simply keeping a clipping in a box, won't stand the test of time. Nope, if you want that memory to last forever, a professional display is the best way to preserve your wedding announcement. So, Why not Crystalize it? Acrylic is extremely resistant to cracking - this is one of the main reasons why the material was designed in the first place. Everyone thought that glass was great, but they obviously knew that it had a substantial flaw - it broke (breaks) very easily. It seems as though you won't really be able to adequately preserve your wedding announcement if the material you're preserving it with could shatter at any little slip. Although it obviously depends on the thickness of your acrylic frame, in general, acrylic tends to let in more light than other framing styles, 80 to 90 percent, that is. Other frames will make it hard for you to read the small print on your announcement; again, it sort of defeats the purpose of framing them in the first place. 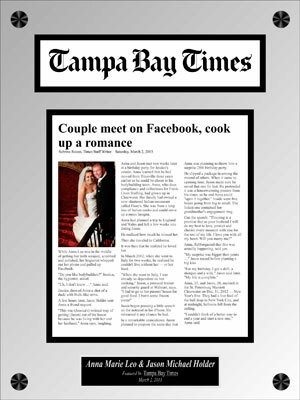 For a reliable viewing of your wedding announcement, go with acrylic. Again, the weight of your acrylic frame will depend on its thickness, but as a rule of thumb, acrylic often weighs much less than other frames. Those heavy glass frames take a lot of effort to hang...carefully so as not to break that touchy glass. Paper fades over time. Sure, you can find UV protection on some frames, but it can get extremely expensive and is still not 100% effective. On the other hand, Our Crystaline Plaques have your article printed directly on the acrylic so there is nothing to protect and nothing to fade or deteriorate. All in all, the best piece of advice we can give you is to choose a professional framing service that uses acrylic as one of their framing material differently than all the rest. You'll be sure to come away with an outstanding finished product, and more important, a lifetime of memories.